Whereas buying a book now and then requires minimal space—I can always accommodate another book on my nightstand or the coffee table if need be—the haul from the thrice yearly book sales is another matter. To be sure that I have sufficient space for half a dozen or so treasures, I’ve adopted the ritual of deep-cleaning and “editing” the bookcase before each sale, in February, June, and October. It works out rather nicely. The books I’m ready to part with go into the donate bag, those I want to share go to family, friends, or neighbors, and those I keep are lovingly dusted and restored to their home on my shelves. I know people who never hold on to books. I know people who only buy used books. I know people who don’t buy them at all. Either they’ve gone totally electronic, or they rely on the library. Which is fine. But I still buy “real” books, and I still keep them. Among them are a few childhood favorites, my Rockwell Kent-illustrated Shakespeare, and two of my mother’s treasures—a gilt-edged edition of Webster’s and a Metropolitan Opera Guide from many, many moons ago. The only college text I’ve held on to is the expansive English Romantic Writers. What can I say? Every now and then, I need a dose of Wordsworth. There are several reasons why I continue to buy “real” books. One is the pure joy of browsing through a bookstore. We don’t have any really good “indies” around here, but when we travel north or south, bookstores are always on the agenda. At home, I rely on Amazon and our local Barnes & Noble. Another is that a book you love becomes part of you in ways that only a committed reader can understand. A third is that I like to support the writers I love, the writers who consistently show up in my pre-release queue. 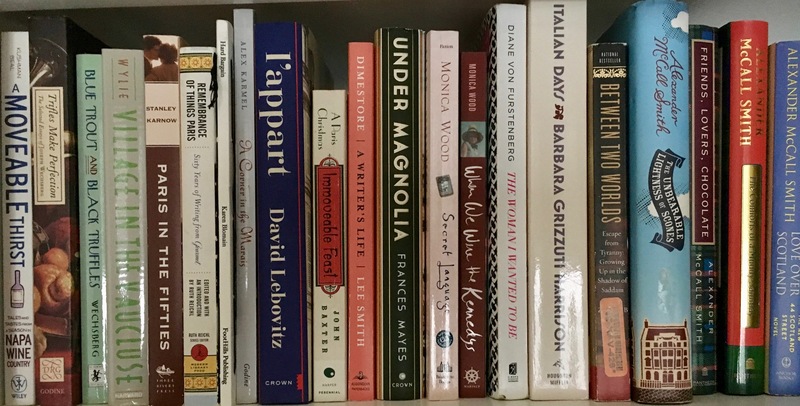 They represent a mix of genres, for sure: Andrea Camelleri, Louise Penny, Richard Russo, Donna Leon, Alan Furst, David McCullough, Monica Wood, Frances Mayes, Gail Godwin, MFK Fisher, Doris Kearns Goodwin, Pat Conroy, and, of course, the inimitable Adriana Trigiani. I love reading about France and food. My daughter introduced me to this series, set in Sicily, that was also adapted for television. Commissario Montalbano is irresistible in either version. I’m currently in the middle of The Shoemaker’s Wife. I loved it when they were in Italy; but now that they are in NYC I have put it down for a week. And I’m ashamed to admit that I have never read any MFK Fisher, though she’s been recommended to me many times. She’s going on my list right now. Thanks. The Shoemaker’s Wife is largely a true story. I loved the opera connection. I hope you like MFK. She fascinates me. Hmmm…. I would say to read some selections from The Art of Eating, then Two Towns in Provence and Long Ago in France.